It’s Roundtable posting day today, and this month we are celebrating the release of “Garden Up! Smart Vertical Gardening for Small and Large Spaces” written by two of our own blogger’s Rebecca Sweet and Susan Morrison. Susan and Rebecca, live in the San Francisco area, and in this their first book together, have hit on a topic that although has been around for a long time, is undergoing a renaissance, with exciting new products and techniques. Look for a review of Garden Up! very soon, right here on the Blue Heron Landscapes blog. Gardens have long been defined by their boundaries, the most romantic for me being old worn brick walls cover with vines and flowers, a backdrop for a beautiful perennial border or a stone patio providing a cozy spot to relax or dine with close friends. There are many ways to create intimacy within your garden, and introducing a vertical element, especially one covered with plants, is a smart choice. An under story tree with a low canopy might provide a ceiling to your outdoor room, or maybe the pattern found on a trellis will ad texture to a screen as clematis climbs it’s way to the top. Here are a few ways we have been using vertical elements to the gardens we create, to soften hardscapes and creat a sense of intimacy. When is a fence, more than a fence? 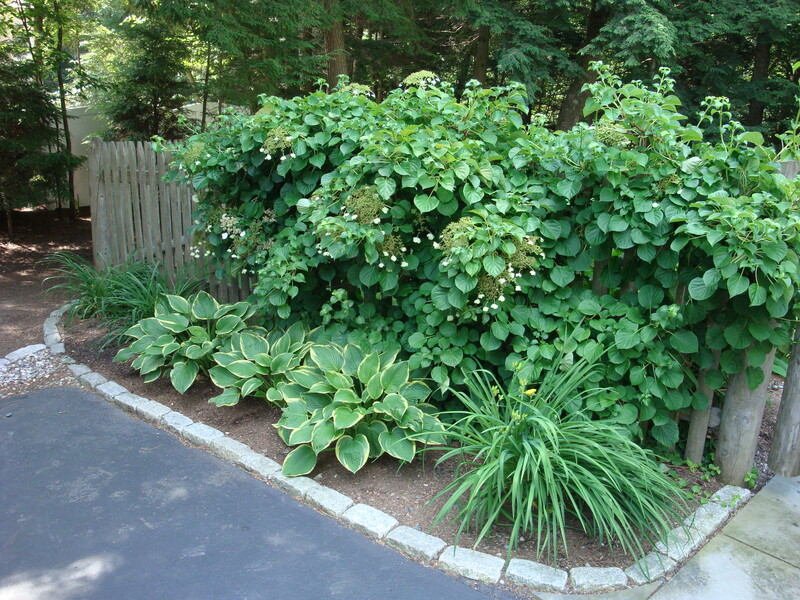 In this picture you can see the picket fence as it works it’s way around the yard, but near the gate the Climbing Hydrangea (Hydrangea anomala subsp. petiolaris), both softens and adds depth to the plane. Planted by our client, this beautiful vine gives both privacy to the backyard and a wonderful backdrop to the Hosta and Daylilies at along the drive. 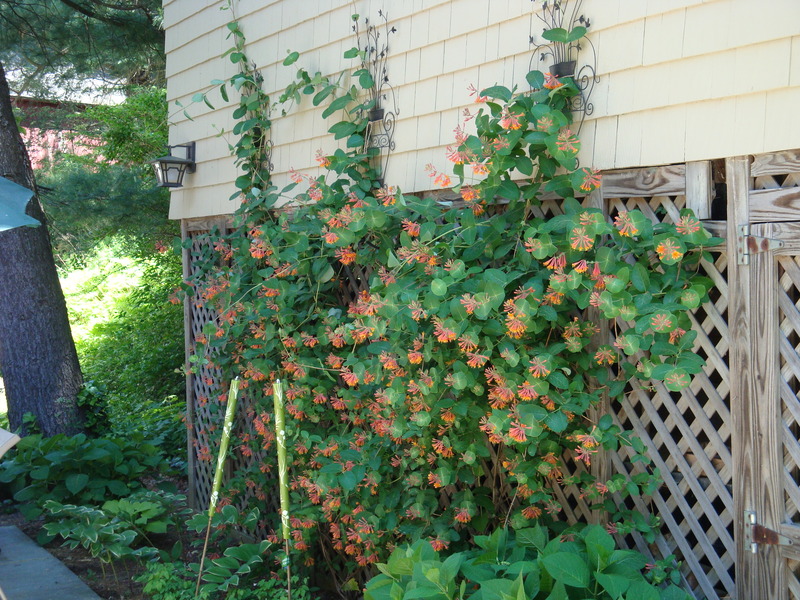 Another beautiful vine, Honeysuckle (Lonicera sempervirens), is seen here covering an ugly lattice wall. A magnet for hummingbirds, this light shade tolerant native brings the scale of the garage it’s planted against to a more comfortable presence. The back corner of this foundation, was left exposed due to the grade change. The size of a stone wall high enough to cover the ugly concrete would simply have overpowered the backyard. The mason’s choice here to terrace the wall was smart, but it left a portion of the foundation still exposed. The custom trellis was built to fit over the wall and planted with climbing rose and clematis. Problem solved! 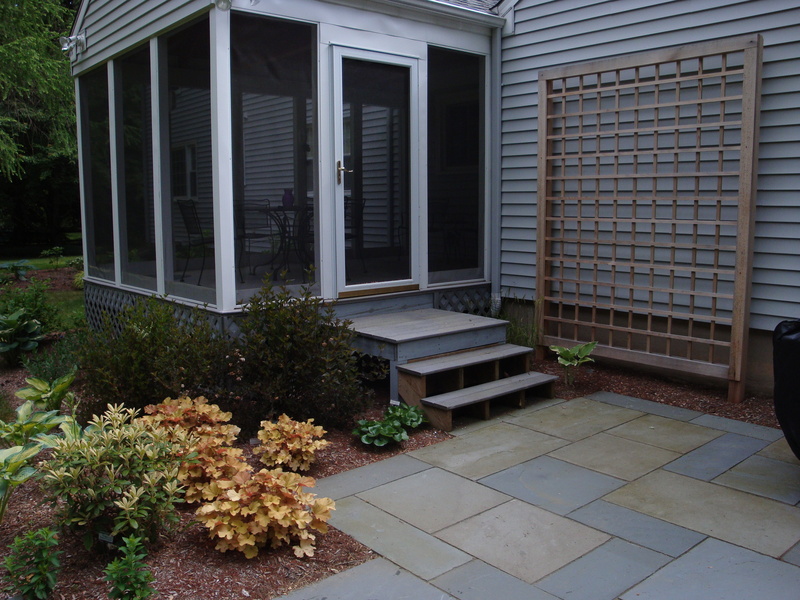 The location of this patio, left us little room to plant between the back wall of the garage and the bluestone. The addition of this trellis solves that problem. Planted later with annual and perennial vines, it also reduces the scale of the building and provides interest from the patio. 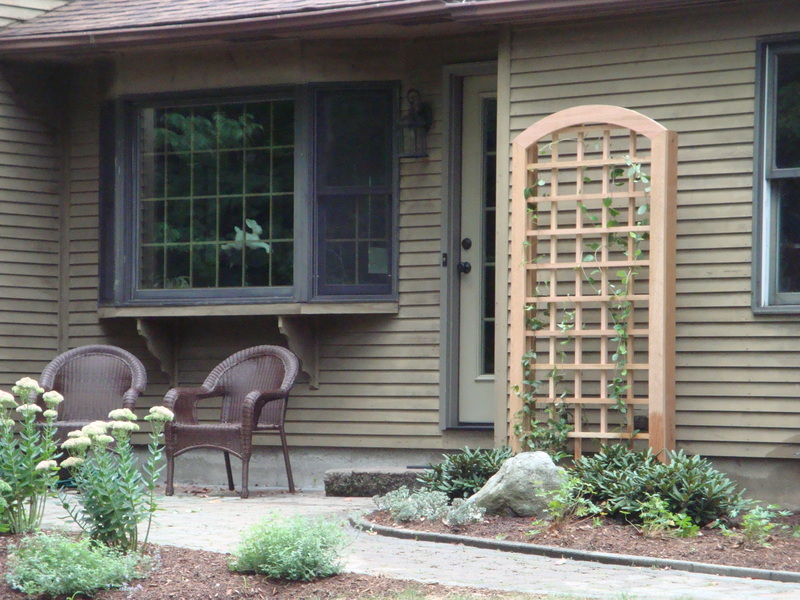 A wonderful little patio near the side door of this client’s house is a great spot to sit and enjoy the garden, or wait for friends until they arrive. The trellis is placed so as to bring visitors face to face with the sunny, happy, clematis growing on it. Can you think of a more gracious welcome? Our final picture is from my own back yard. Surrounded by towering oak and hickory trees, our back deck is a lovely spot to relax, and we dine here as often as possible. After experimenting a few times, we have settled on this post with six pots winding their way to the top. It gives the deck (one step above grade) a somewhat elegant and interesting accent. Don’t you agree? Softening hardscape, providing privacy or creating intimacy are all benefits of a well planned vertical plane, and whether your working with a grand space, or a small intimate one, I hope you’ll think to Garden Up! Do you like our solutions? Think you might add a vertical accent to your garden? We would love to hear about it, so please leave us a comment! And after you do, please follow th links below and visit the blogs of my Garden Designers Roundtable friends (including our new authors Susan and Rebecca), and see what creative ideas they are sharing. Beautiful treillage, Scott, and those pots on a post have given me an idea for my own garden. Thanks. Thank you Helen! Those corner posts are mentioned often when we entertain, and are super easy! Have fun with the idea! Great to have the front end pics of gardens going vertical. Can’t wait to see the results in 2 years. Thanks Tara! The waiting is the hardest part. Loving the craftsmanship which has gone into those trellises. They look like works of art in themselves! Especially luv the one covering the foundation. Neat! Thanks so much Robert, I appreciate the compliments! Those trellises are gorgeous – did you come up with that corner trellis against the foundation idea? Good grief – that’s genius!! Very inspirational! Thanks, Scott! Thanks you Rebecca! Yes that was my creation, glad you loved it. The client was thrilled! I too am loving that trellis against the tall foundation. It’s a sign of great craftsmanship when the trellis (or fence or whatever) looks as great bare as cloaked in vines. Your own “stairway to heaven” post is a fun and unique vertical accent too, Scott. Thank you Pam! I love the look of cedar, and almost don’t want to cover it up. 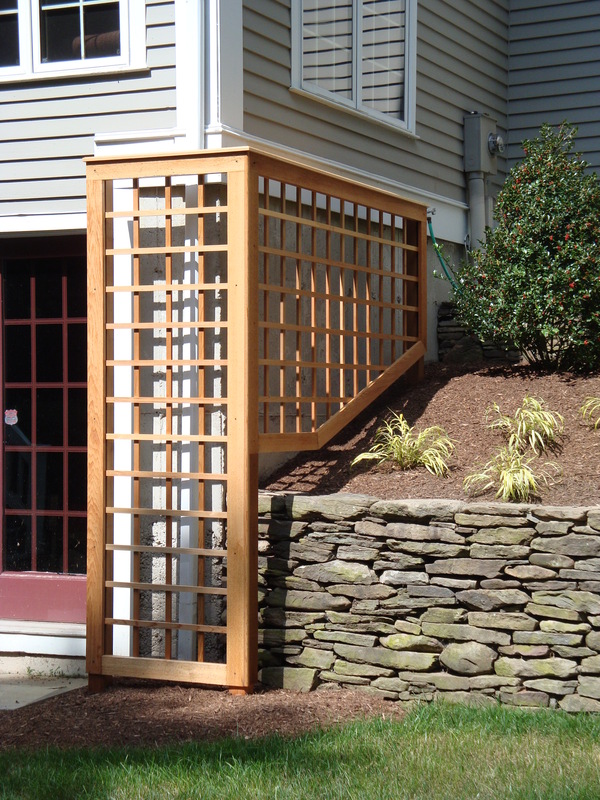 Yep, you may need to patent that corner-foundation-cover-trellis idea! We’ll just call you Scott “The Trellis” Hokunson from now on. Seriously, some great solutions to bringing color and texture to tight spaces! In a traditional environment trelliage is a certainty…what’s great about what you show is the superb craftsmanship of them. Thanks for sharing. Thank you for those kind words Susan, I do appreciate them! Missed you at Logee’s yesterday, but I hope to make the next one. My vertical challenge is hiding meter boxes that are kind of high on an outside wall… I can’t attach a trellis to the wall and freestanding support structures are too low. I guess I need something 8 or 9 feet tall, but even a custom one will be hard to install and stabilize. I love your post with hanging pots! That’s an idea that could be incorporated in lots of places. We missed you also Laurrie, definitely worth the trip though! Those electrical meters are always a challenge, I’m not sure why more thought isn’t put into their placement. It always drives me crazy. All of the trellis’ you see here are free standing so would work for you. We don’t attach to the house. 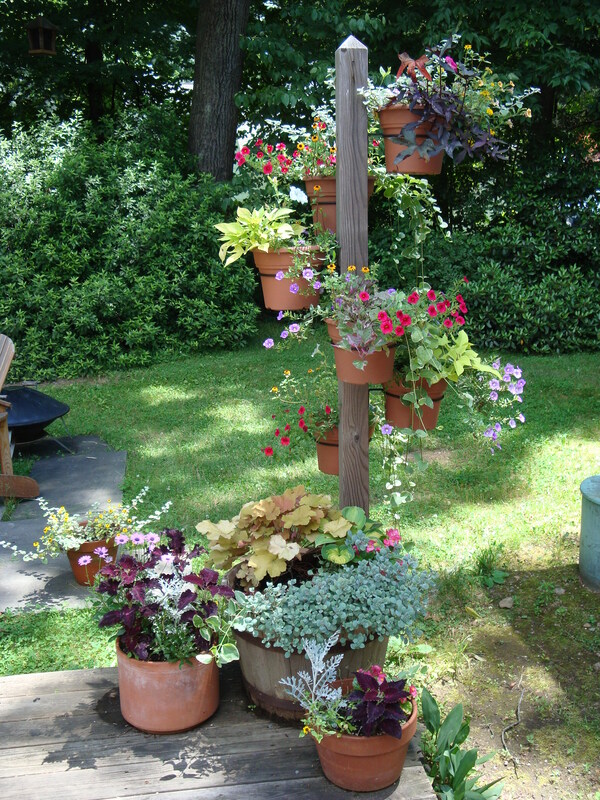 The post with pots is a fun element, hope you get to use it in your garden! Very nice! I have a little garden in Texas and one of my problems is that any pot that is on the ground sooner or later ends up with fireants moving into the pot…ugh The post planter is a great way to save space, get vertical dimension, and the pots up high. Thanks. Ugh! Glad we don’t have to deal with fire ants here, and I hope the post planter works for you! Thanks for commenting Linda! “When is a fence more than a fence?” What a great way to sum up your post. While Rebecca and I are naturally hoping the current trend towards exotic living walls will help spur book sales, the truth is your post sums up a lot of Garden Up’s content: making the ordinary parts of a garden extra-ordinary. Thanks for the nice comments Susan! You and Rebecca have inspired many with your book. I have only had a chance to skim through it so far, and can’t wait to read it.